There comes a time when almost everyone suffers from a broken heart, it's how you deal with it that counts. 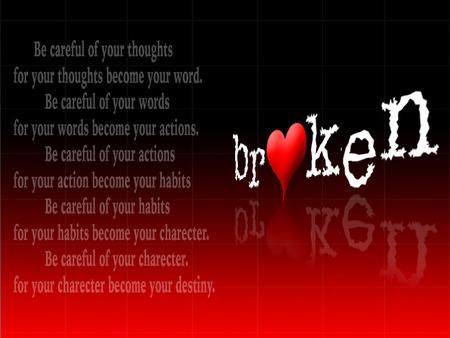 Broken hearts are inescapable if you are in love or have ever been in love. It’s downright painful and no one wants to feel it ever again. When I broke up with my dude, I remember feeling as though if I could just rip my insides out, I’d feel much better. I slept for days in order to escape thoughts of him and the misery. If I could just control picking up the phone, begging him to come back and then cursing him when he laughed at me for even suggesting such a thing. It was an ugly scene and I never, ever want to repeat it again. Sure, twenty years later and I can laugh about it, but trust and believe, it was no laughing matter then. This sister was a hot mess. Surprisingly, I went from not being able to eat or to breathe without him to actually living again and in a short time. Truly, don’t you wish we could get over a heartbreak with the snap of the fingers? I know you do. Sadly, some broken hearts never mend. Healing is a challenge and that’s the truth. You try not to think about it, but the even the sun rising reminds you of your ex. Um, yeah. It’s apparent all of the radio stations know because they never played “that” song so many times before. Not only that, but you can’t even escape it by watching television. You surf the channels and all of them, including the weather channel, is showing a sad love story. You make your way to the bathroom only to remember you bumped into him right there at this spot in the hallway. Yeah, no matter where you go or what you do, there’s something, somewhere to remind you of the heartache and pain. But tell me who hasn’t had a heartbreak at least once in their lives? I don’t know of any person who hasn’t. Although your situation may be different from mine, I can help you to get over your heartbreak. Through my experiences and coping with heartbreak of my own, I know what heartache feels like and I learned a thing or two or three about relationships, more so, broken hearts. Keep reading to find out how to get over a heartbreak and have fun doing it! Where do broken hearts go? Well, you start by gathering your girls and your credit cards and head to the shopping malls. Shopping is one of the best retail therapies for broken hearts or so says my daughter. She loves to shop. Keep the spending to a limit, however. You don’t want to become depressed about the upcoming bills on top of what you’re going through already, but do treat yourself to a few expensive gifts. One of the things I like to do is go over to the makeup counter and let the cosmetologist make me over. Getting a new look and new makeup changes my attitude instantly… gets rid of all the negativity. How to heal a broken heart? After or instead of the shopping spree, make an appointment at the spa. Get a facial, sit in the sauna and get a massage. There are several kinds of massages. We suggest getting one to relax your muscles, in particular, your mind. Don’t forget to put your feet in the tub for a pedicure. You deserve it. You know you can’t have your feet done and not have your nails done. In other words, get the full treatment. As a matter of fact, all spas should have a Broken Hearts special. Hang out with your girlfriends! You’re looking and feeling fabulous. Now, you must go out and flaunt all this work. Pick a night spot you haven’t been before but are dying to go. Maybe it’s in the next town or the next state for that matter. To put it another way, go to a place nobody knows your name and let your hair down. Have a few glasses of wine to relax with [without overdoing it] and dance until you sweat. After the night is over, I bet you will have one of the best night’s sleep since your breakup. One of the best ways I know to get over a man is with another man. Call it what you want, but it works for me. Maybe you met someone interesting while hanging out with your friends. Pick up the phone, girl, and call him! Oh, I’m not saying by any means become intimate with him or marry him, but at least, have a conversation with this new guy. He could be the reason why you’re busting a gut. Laughter is highly therapeutic and you need it now more than ever. However, I must point out if you’re thinking about dating him, don’t reveal everything about your breakup just yet. In other words, don’t drive him away before you get to know each other. Sobbing about your ex every ten minutes like a crazy lady won’t entice the new man to stay. Yes, a DJ can literally save your life. Music heals the soul! Songs like Adele’s “Rolling in the Deep” and “Hello” are motivational and can be a tremendous help while going through a breakup. However, don’t listen to the sad songs which bring you down or remind you of your partner. Writing can be a curative way of getting in touch with your feelings and putting things into perspective without talking to a lot of people. Don’t get drunk thinking this will heal your broken heart. A drunk lady is never cute and besides, who likes hangovers? I certainly do not. Not being able to get out of bed for days because you drank too much is not a good excuse to miss work or to handle your business. Okay, we know you must talk it out but enough is enough. Your girls will eventually get tired of the same old conversation and stop accepting your phone calls. In this case, what you can do is have a Waiting to Exhale party. Gather your girls together and the fellas as well, some food, drinks, ice cream, cake, whatever your heart desires and have a party in his honor. Blow up his picture and throw darts at it. Most compelling evidence shows us more so than women, men commit suicide over failed relationships? 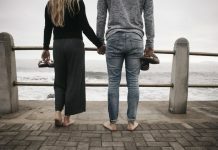 According to the psychotherapist, Dr. Jean Cirillo, it’s more difficult for men to get over a heartbreak than women, especially when the breakup is not their idea. Men go through several stages of heartache: denial, anger, bargaining, depression, and acceptance, but not always in that order. Get it all out of your system, but once the party is over, there’s no more pity, no more anger, no more hate. Understand? You’re done with that. It’s time to move onward. Go through your phone and delete all of his pictures. Delete and block him from your calling or texting and specifically, the social media accounts. Change your passwords if, in fact, you guys did exchange this information. Don’t ask your friends to check his page either. Consequently, this will only add fuel to the fire if you should see or read anything he may say out of anger or hurt. You probably wouldn’t know what to say if you run into your ex anyway. Somehow, we become speechless momentarily anyway. As soon as they are gone, we think of what we should have said, but it’s too late. Dealing with a heartbreak is a moment to moment, day by day process. Granted, no one expects you to get over a breakup in a day or even a week, but it’s important, in the hope that you find a solution, to try. Not everyone you meet will stick around, and that’s fine. Take it for what it’s worth, learn from it and move on. Some of the best messages I learned were in a Tyler Perry movie or play. Given that it’s helped me, won’t you try a Madea marathon? Provided that you have some ideas to help mend broken hearts, let us know how you did it. Comment below.